•	Shuttle service is provided approximately one hour to tour departure. If you are driving yourself please plan on arriving at our cabin at least 30 minutes prior to scheduled departure. •	Bring your camera. The beauty of the National Forest you are about to ride through is unparalleled! •	Check-in at cabin and fill out a liability waiver for everyone in your party. •	Get dressed! If you have warm ski wear and layers please bring them. Gloves and goggles. We do have snowsuits, snow boots, and goggles available if you need them. Open faced DOT helmets are provided for all guests. Neck warmers and face masks are available for purchase. •	Meet your guide and listen to the orientation. This time will help you understand the operation of the snowmobile and provide you with information on what to expect during your tour. •	Children 3 years of age and older are welcome. •	Must be at least 16 years of age with a driver’s license to operate a snowmobile. •	Must be at least 18 years of age to operate a snowmobile with a passenger. •	All children are welcome to drive in the open meadows with an adult on the back. 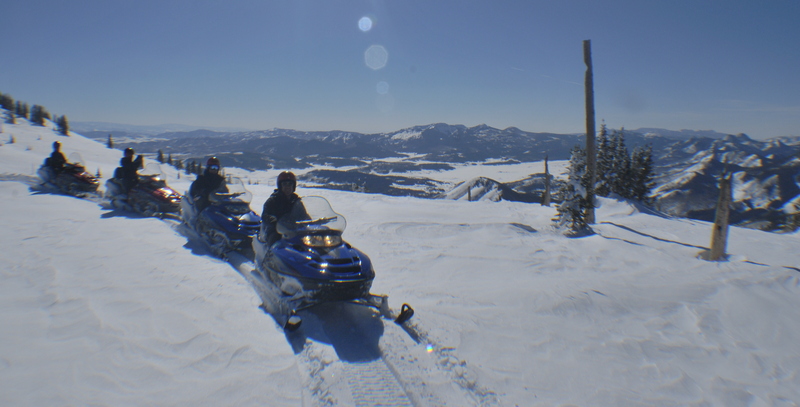 •	All tour times are approximate as snowmobiling is greatly influenced by weather. •	If you need to change the day or time of your tour we will try our best to accommodate based on availability. There will be no charge in this event.